Tapping on a bookmark will load it. Long-pressing on a bookmark will open an edit dialog. As can be seen from the screenshot, there is now a create folder floating action button above the create bookmark button. 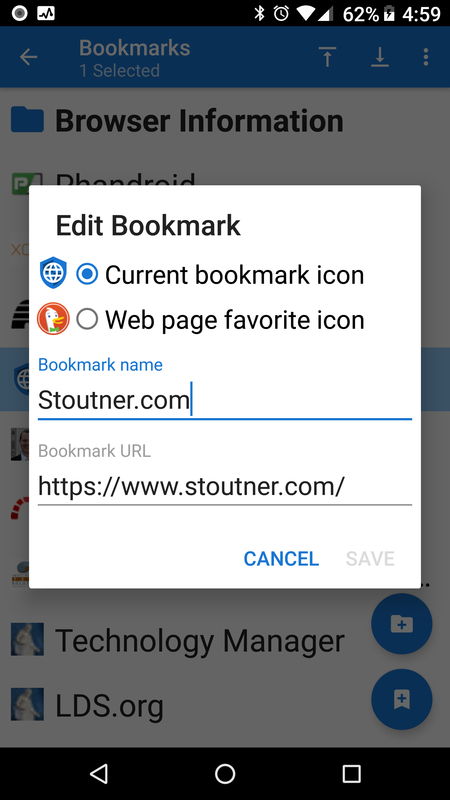 The top floating action button opens the bookmarks activity. A number of improvements have been made to the bookmarks activity. Moving bookmarks is now much more efficient, which should remove the delay that was previously experienced. 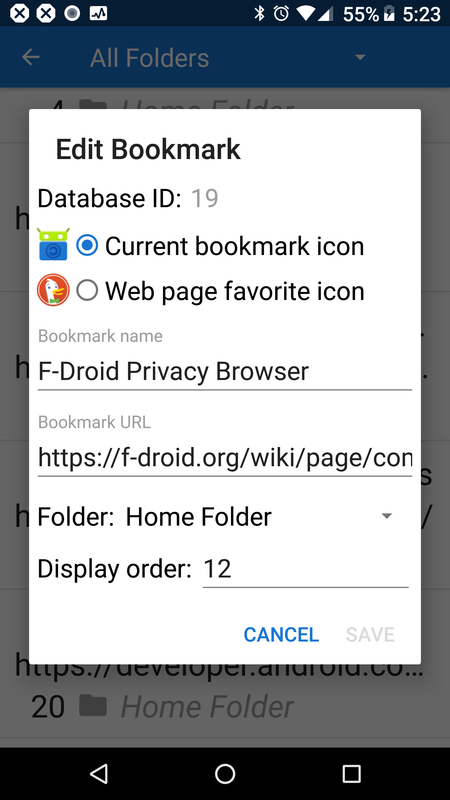 The bookmarks display order is now updated upon deletion of a bookmark, which keeps new bookmarks from being created in the middle of the list after a number of bookmarks have been deleted. A number of action buttons in the dialog boxes are now disabled if there is no action for them to perform. 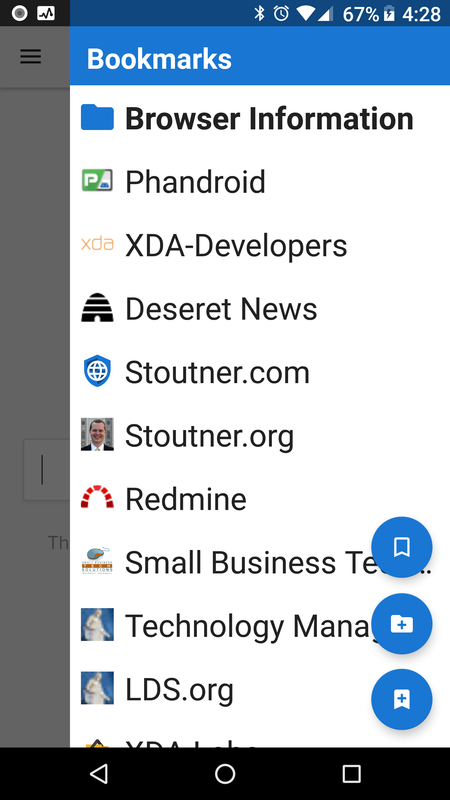 The “move to folder” icon is now an arrow inside of a folder. Previously it was a star inside of a folder. Deleting bookmarks rapidly used to confuse Privacy Browser (because it waits until the Snackbar is dismissed before processing the delete). The delete menu item is now momentarily disabled until the previous delete has processed. When bookmarks are deleted and then undeleted, they are now reselected. Privacy Browser is now more sophisticated about scrolling the screen when moving bookmarks. Previously it would lock the bookmark being scrolled five items from the top of the screen. Now it lets the bookmark float naturally through the screen and scrolls when the bookmark reaches the top or bottom. In the bookmarks database view, it is now possible to filter the bookmarks by folder. 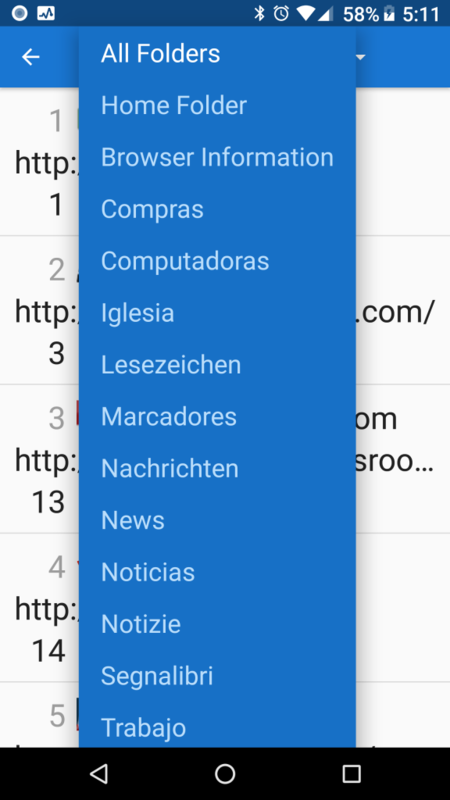 The database view will become more important when bookmarks can be imported and exported. Although there should never be any problems® with the bookmarks database, the database view provides a powerful repair tool when they do happen. It is now also possible to edit bookmarks from the database view. Some improvements were made to Night Mode to eliminate the white flash that sometimes occurred when a new page was loaded. They keyboard is now hidden every time a new webpage is loaded. Previously it was only hidden if the webpage was loaded from the URL box. The target API has been bumped to 26 (Android Oreo, 8.0.0) and the user agents have been updated. Konqueror was removed as one of the pre-configured user agents, as it is being discontinued and its replacement, Falkon, is not yet ready. 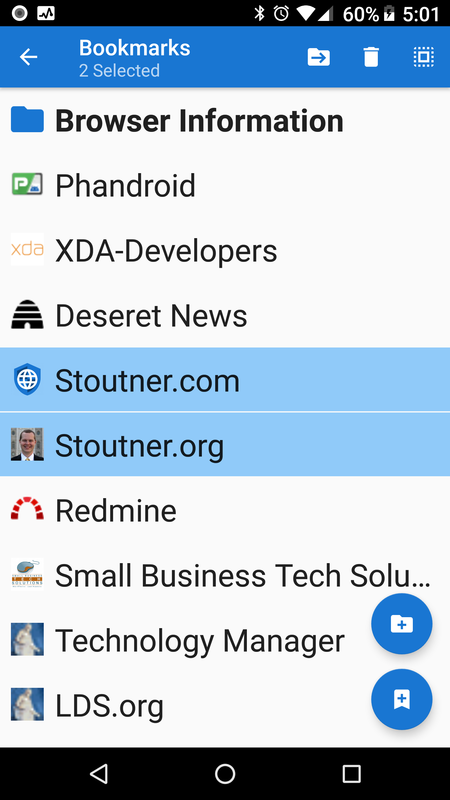 The fastlane screenshots have been adjusted, so that hopefully they will finally work on F-Droid with this release. The paragraph about Verizon’s tracking header has been removed from the Tracking IDs section of the Guide because, due to public pressure, Verizon no longer abuses their customers in this manner. As usual, Francesco Buratti provided an updated Italian translation and Jose A. León provided an updated Spanish translation. The next release will likely be the last in the first half of the 2.x series. 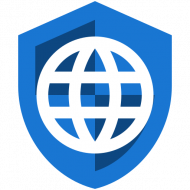 The major planned feature is to switch the ad blocker to use EasyList.